Someone said to me the other day “Cecelia, we know you’re all about curb appeal,” and I’m not sure whether it was a compliment or an insult. To her point, I made zucchini carpaccio this weekend for a dinner party not because I thought the recipe sounded very tasty – but because I knew it would present itself well. To my surprise, the dish not only looked beautiful but it was a uniquely refreshing and delicious dish! There are recipes for zucchini carpaccio just about everywhere right now but I noticed two very appealing on Chow.com and Epicurious.com. Each site presented their own variations. I was nervous about the zucchini tasting too raw and thought it was a better idea to dress the salad in lemon juice and olive oil first (Epicurious recipe). And I thought that feta cheese would add a salty bite in contract to ricotta (Chow). This salad is a cinch to put together – especially with mint growing in the backyard and leftover feta and pine nuts in the fridge. And, I picked up the zucchini at the new Downtown Farm Market just around the corner. With summer zucchini season around the corner – I advise you put this on file! Assembly: Slice the zucchini using a mandolin. Dress with lemon juice, lemon zest, olive oil, salt and pepper. Taste for seasoning (remembering that the feta is very salty). 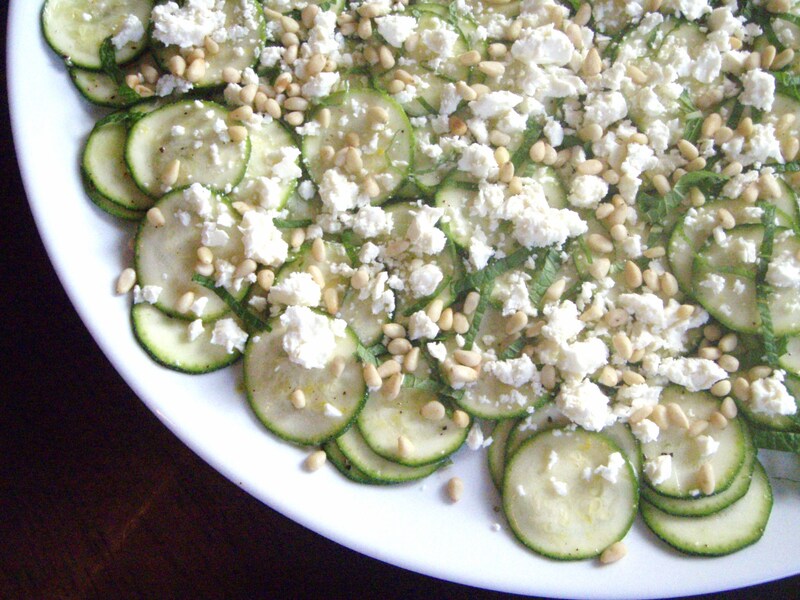 Scatter on a platter and top with crumbled feta cheese, pine nuts and mint.